Through a quirk of scheduling, I was in Amsterdam a week ago for a corporate law conference and (after a brief return home) am now in Milan and Rome for nine days with the twelve students in my Globalization of Corporate Governance seminar. The combination of corporate law conferences and side trips to several of the world’s great art museums has gotten me thinking—however ill-informedly—about the relationship between markets and art. In my seedtime, we always assumed that great artists invariably resisted the commercial tendencies of their time. 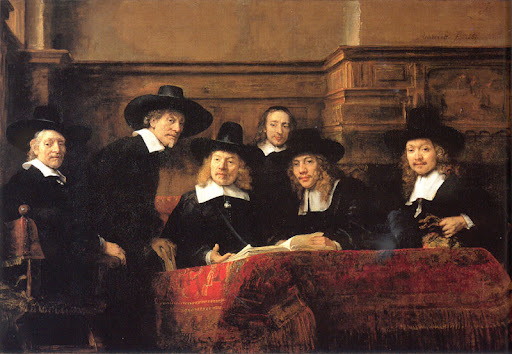 But after a couple of hours with Rembrandt’s paintings of wealthy burghers (like this one, The Sampling Officials (1662)) from 17th Century Holland in Amsterdam’s Rijksmuseum, or the Medici commissioned paintings in the Brera here in Milan, it seems clear that art-as-resistance is not a universal tendency. In 17th century Holland and Renaissance Italy, markets and art blossomed in tandem. It may be that artistic trends alternate between fellowship with and resistance to markets. But I’m more inclined to suspect that markets and art invariably move in roughly parallel directions. The fragmentation of the art world in the past several decades may, for example, echo the destabilizing effects of globalization and rapid innovation in the financial markets. Perhaps this means that we will see a period of neotraditionalism both in art and in corporate and financial life once the current crisis passes. Yesterday I found myself in an Italian language service in Milan. The church—the Chiesa Cristiana, which doubles as Milan Bible Church in the afternoon-- was a thirty minute walk through nondescript neighborhoods (a reminder that Milan was heavily bombed during World War II) from my hotel. I ended up in the Italian language service because of the timing of the services—certainly not because of proficiency in Italian, which is still years away. The church was downstairs in a little apartment complex with a small courtyard. A man stood by the door to let people in, which seemed a reminder of how small a minority evangelicals are in Italy. The room was painted a bright, deep yellow, with little posters of passages from John (e.g., “I am the life …”) on the walls. The wonderfully lively service made me see contemporary worship songs projected on a screen in a new light. The general familiarity of praise songs, and the simplicity of the words, enabled me to join in the worship to an extent that wouldn’t have been possible otherwise. Even I understood lines like “Cantero del tuo amor/per sempre” (I will sing of your love always). It reminded me of the argument that the Catholic church has always made for paintings and other art in the church—that it made it possible for ordinary people to understand the richness of the Bible in an era when few could read. Harvard will be hosting a conference honoring Bill next weekend. The conference will consist of four panels of speakers on Friday and Saturday, the first three on criminal law and procedure and the last on Bill's life and work generally. The line-up is extraordinary (here's the Harvard announcement and here's a fuller description from Orin Kerr, one of many terrific speakers who will be there), and it promises to be a memorable event. It's open to anyone who would like to attend. A week ago, at the end of a nine day trip to Italy, I waded through a vast protest in against Prime Minister Berlusconi. At a reception that evening, an Italian former student explained that, after Berlusconi’s minions missed the filing deadlines for regional elections, he simply had a law passed to change the rules. For my former student and millions of Italians, this was the final straw. Many of the protestors carried signs saying “Basta”—that is, Enough. I first heard about the “deem and pass” strategy the Democrats were originally planning to use to pass healthcare the next day, when I returned to the U.S. I couldn’t help but think of the similarities between President Obama’s willingness to cut procedural corners and Berlusconi’s. Overall, the differences between the two are far more pronounced than the similarities. Through his control of many of the main television stations and newspapers and through threats to others, Berlusconi has largely stifled the Italian media. In the U.S., the media is much more wide open. In addition, Berlusconi’s battle seems entirely personal at this point—an effort to cling to power—whereas Obama is fighting for a reform he campaigned on and is obviously committed to. But here, as in Italy, assuming that citizens will overlook procedural manipulations because of an underlying confidence in their leader is a dangerous strategy. It may work once, but even considering these kinds of tactics in the coming debates over financial reform and other legislative issues could have devastating consequences for Americans’ already shaky confidence in government. The Caravaggio exhibition at the Quirinale in Rome is one of those rare exhibitions that would justify a special trip. I’m tempted to try to go back (though I readily concede that I’m always tempted to go back to Rome). Caravaggio died young and didn’t leave a huge number of paintings, so the exhibition isn’t large by blockbuster standards: ten rooms, often with one or two paintings per room. But it is a rare opportunity to see the full sweep of Caravaggio’s career in a single setting. What a strange, disturbing, irresistible career it was. Four hundred years later, Caravaggio still resists being put in an art historical box. He managed to paint some of the most magnificent Biblical paintings we have, while also leaving disturbing images of sexually charged young boys—both of which are well represented in the show. Caravaggio’s paintings are not flawless in the way, say, a Raphael painting sometimes seems flawless. Often the objects are oddly small in scale in comparison to the figures. In “Card Sharps” [here], the dice at the lower left seem microscopic by comparison to the scale of the figures. But paintings are often so arresting, and so psychologically rich, that the distortions seem trivial. (And it may be that art historians even have clever explanations for them). The exhibition includes the original version of “The Conversion of Paul,” which hangs in Santa Maria del Popolo, a fifteen minute walk from the Quirinale. For some reason, the original version was rejected. It’s not quite as dramatic as Caravaggio’s second effort, but it too is a remarkable painting. I assume art historians have an explanation for the rejection—the only thing I could imagine is that perhaps Paul’s bare chest seemed inappropriate for the chapel for which it was intended. Caravaggio seemed to have a thing for John the Baptist: he presented John in a variety of different poses, most of which are far removed from the Biblical portrayal of John. John is often languid and effeminate, with a hint of sexuality. Perhaps this reflected the interests of Caravaggio’s patrons. My favorite of portrayal of John is this one, which looks an awful lot like a psychedelic rock singer from the 1960s—someone who might have performed at Woodstock. (Extra credit if you name the singer he most resembles). It’s hard to imagine a better day than one that begins with the St. Matthew paintings in San Luigi dei Francesi and the Madonna of the Pilgrims nearby, includes several hours at the Quirinale, and concludes with a visit to The Conversion of Paul and “The Martydom of St. Peter” at Santa Maria del Popolo. But if you’re thinking about doing this, buy your tickets in advance on the internet. It took me three tries to get in: I was thwarted once by the huge crowds, and a second time when I tried to slip in at the end of the evening (there were no crowds, but I was turned away because I hadn’t reserved a ticket in advance).